I spent about 15 minutes this morning with Tim Allen, Head of Technology for Crompco Corporation. I wasn’t in his office, I wasn’t on the phone with him, our time together wasn't even a series of email exchanges – it was in a 3-dimensional virtual world: Second Life! With about 150 staff members and 65 trucks in its fleet, Crompco services gas stations from Maine to Florida on the I-95 corridor. Tim and his staff identified a “learning gap” when they were training junior technicians on the underground layout of gas stations. This underground layout isn’t visible if you visit a local gas station… it is underneath the asphalt. Previously, technician trainees at Crompco learned about the underground layout by using illustrations on a white board or other 2-dimensional learning aids in a classroom setting. Learning about a 3-D construction layout in a 2-dimensional diagram wasn’t perfect for students so sometimes they were lucky enough to find a gas station in construction where they could do a site visit. Unfortunately, there were times when finding a gas station under construction wasn't possible. That’s when Tim and his staff had a great idea: let’s do the learning in a 3-D virtual environment! Enter Second life. 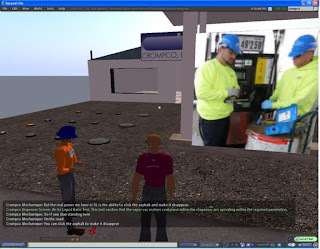 Tim and his staff have created a virtual gas station in Second Life. One where the asphalt can be removed and the major aspects of the underground layout can be observed directly. In Second life, with your avatar, you walk right beside the underground tanks. One is displayed in cross section showing the gasoline inside. The pipes are all clearly marked showing those carrying different grades of gasoline to the pumps. The recovery ventilation system is also shown. In addition to this 3-D model that students can actually walk through and examine from several angles, some slide shows are also hosted at the station, which explain related training activities and safety procedures. Tim informed me that part of the training activities also involve the driving of a fuel tanker truck onto the virtual premises to simulate filling of the underground tanks. Overall I was quite impressed. 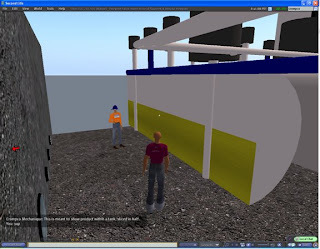 Clearly, this virtual training space met a need for Crompco in the formation of their technicians. Kudos to Tim and his staff for taking the leap to Second Life in order to meet their specific training needs. A local NBC affiliate even featured them in a story they broadcast in March 2008. 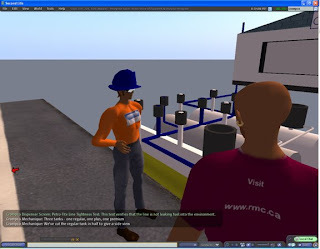 If you know of any other examples of companies using Second Life for training purposes, feel free to share them with us by clicking the comments button below.